Aaaaand all of my followers just abandoned me forever. Actually, I’d be willing to put down TWO ENTIRE WASHINGTONS and bet there are more sardine lovers out there than we think. Eh? Are there? Hello? This is the thing. Sardines are a regular for me. And I’m going to tell you something that you might not believe, but you MUST know I’m not fibbing at all when I type these next words. The gremlins dig them, too. Matter of fact, remember when I joked about having a sardine tasting party on their birthday, but then had one anyway because I wanted sardines with grainy mustard on Triscuits? ‘Memba? Well they TOTALLY TOOK PART AND SNARFED. THEM. DOWN. LIKE. FERAL. DOGS. 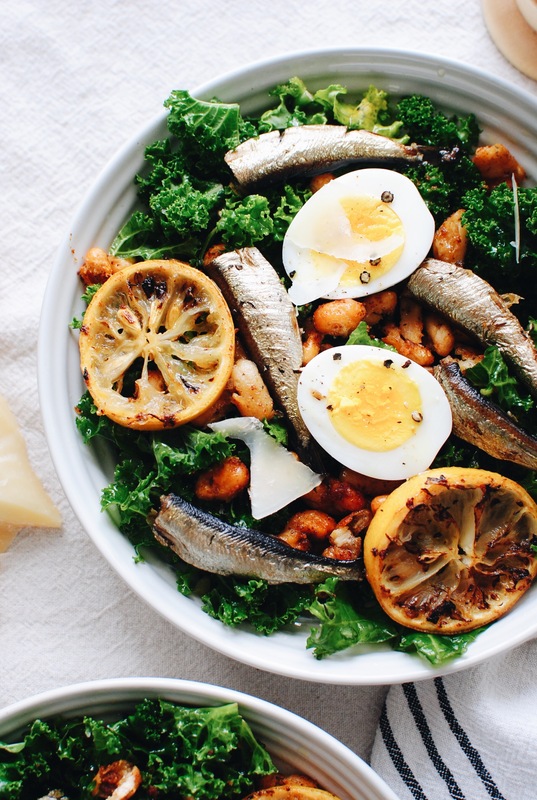 So I thought I’d share with you an amazing salad with roasted lemons and sardines with spicy cannellini beans. And semi-soft boiled eggs! You’ll see why they’re only semi soft. It was this whole thing. But I’ve dealt with my sadness since then. So, the spices – it’s an easy-to-remember mix of smoked paprika, sumac (no need to seek this out! I had some on hand and I like the flavor so I used it), onion powder, cumin and salt. A teaspoon each. You’ll drizzle the beans with olive oil, sprinkle the spices over the beans, then lightly toss with your fingers to coat. Done. As for the sardines – this specific kind was only $2! Brisling, lightly smoked, in oil, medium sized. LOVE THEM. But if you prefer the bigger fishies, do it, brah. Then you’ll slice up a lemon and arrange the slices all willy nilly on the baking sheet. 450 degrees and 15 minutes later – those beans are crispy! The lemons weren’t quiiiiite where I wanted them, so I took the beans out and broiled the sardines and lemons until they crisped up and darkened in places and my soul leapt out of its cavity and did the Macarena. Oh! And in the meantime, you’ll either hard boil or semi-soft boil two eggs. I wanted the yolks to be jammy and soft, but the kids needed something which required the amount of time that I would normally use to address the eggs and get them cooled and peeled, but that specific time went to put out a fire with the gremlins. So. There we have it. Not soft enough. Look at this! I massaged the chopped kale (that you can dump straight from a bag) with a little bit of oil while everything roasted, just to give it a head start. 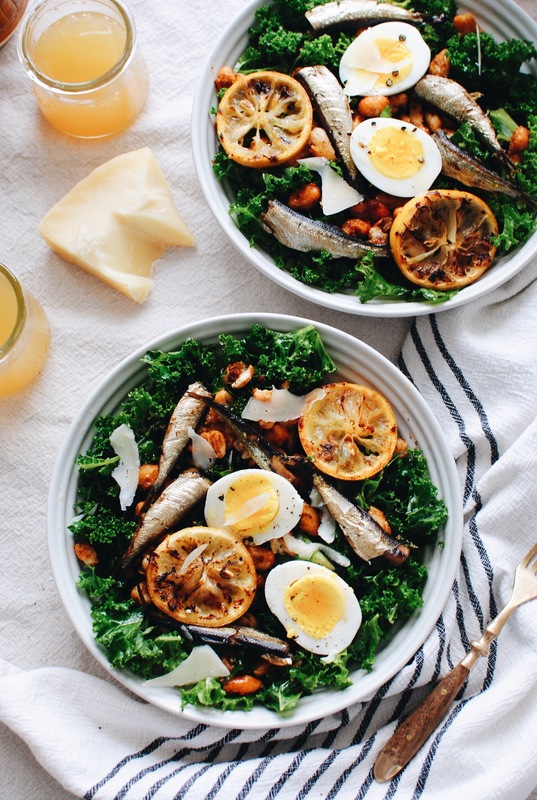 And the sardines – let me assure you, they’re not what you think they are. 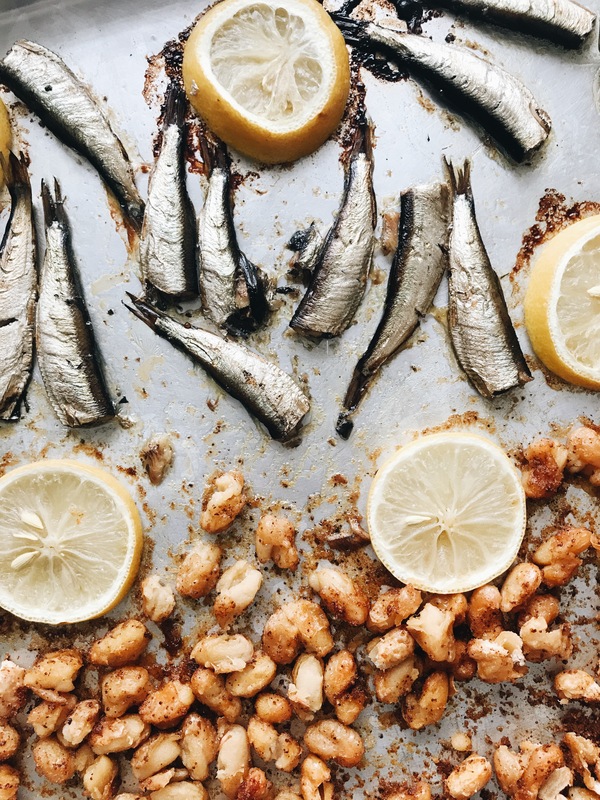 Especially roasted, they’re delightful little salty bites of ocean. Not fishy. Totally umami-ish. And all mixed with crispy spiced beans and the eggs omG. Everything is perfect together. PERFECT. And total January food. Look at you with this bounty of nutrition! Fist bump? No? Also, there’s no real need for an official dressing. The oil that you’ll massage into the leaves, plus the remaining oil and flavors from the roasted heaven you just poured on top will do the trick. SO TELL ME. Are you a sardine fan? Do they scare you? Have you even tried them? And if you ARE a sardine lovah (said like Carrie Bradshaw in that one episode where she’s talking to shoes in the department store), tell me how you eat them! Straight from the tin on crackers? Chopped and in a pasta? Grilled over a bed of charred veggies? You know I need these details to thrive in this world. In a small bowl, combine the spices. 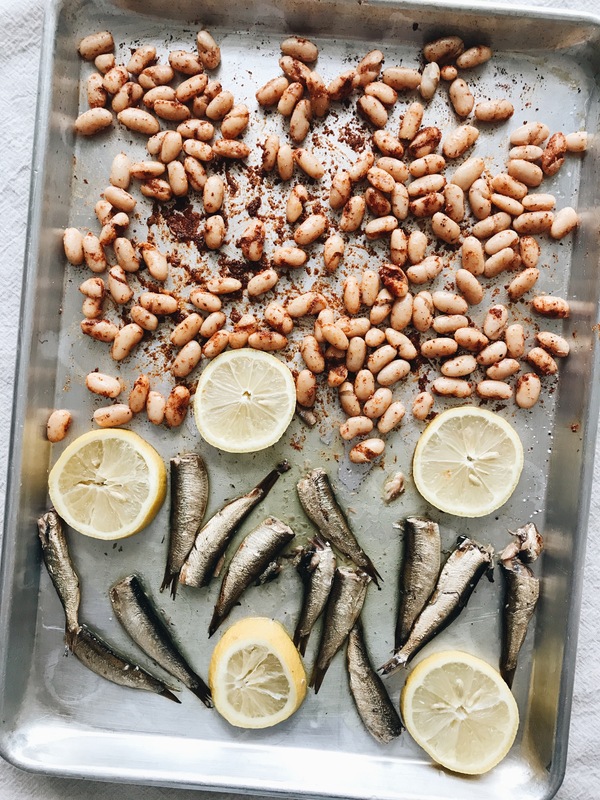 On a baking sheet, arrange the beans on one half, and the sardines on the other. Be gentle getting them out of the tin! They’re delicate little babies. Sorry I called them babies. Drizzle the oil from the tin over the sardines, and 2 Tbs. olive oil over the beans. Sprinkle the beans with the spices and toss with your fingers to coat. Arrange the lemon slices on the sheet. Roast for 15-20 minutes, until the beans are splitting and crisping up! Remove the beans from the sheet, and broil the lemons and fish until they darken and char, and the tails start to curl up. Don’t be freaked out. This is a good thing in life. In the meantime, rub the last two Tbs. oil into the kale leaves, softening them just a tad. 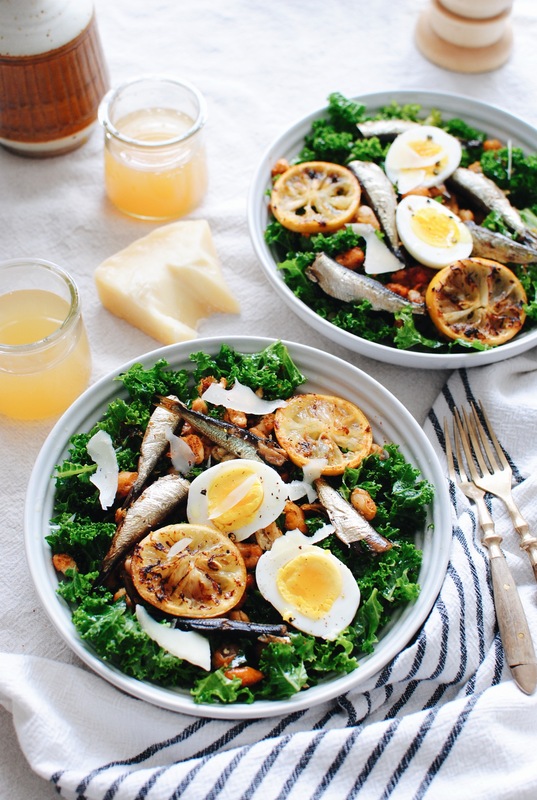 Then sprinkle the beans over the kale, along with a few sardines, lemon slices, and a boiled egg. Garnish with fresh parmesan shavings if you want! Grind of black pepper. Done. Eat it. You will FREAK. Whoa, I'm scared of sardines. Do you just munch the guts and bones and tail and not even worry about it? I know they are a cheap and healthy protein source, I would love to love them but yeah... scared. Oh don't be scared!! I am TELLING you, the bones are so tiny they just dissolve in your mouth. You must try it! Oh absolutely! It's DELICIOUS. So much flavor. Nothing "skiny" about it. It will just dissolve in your mouth like the glory it is. Try it! I have half a leftover bag of kale to use up, soooo because of that - and because I love and trust you and your recipes - I am going to try this Saturday! Sardines and all! EEEEK! #TeamSardines All. The. Way. Whenever I want something tasty but not time consuming, I throw them, chopped up olives(I use Kalamata and Castelvetrano), a few capers and a touch of red onion in a pan with a bit of EVOO and lemon juice, plus maybe a tomato if I'm feeling fancy, and pour over pasta. It's delicious. sardines rule. on crackers, with vinegar/hot sauce= yum. also on bagels w/ cream cheese- like lox. my kids liked them, too- from the get-go. this salad looks great- will make soon! 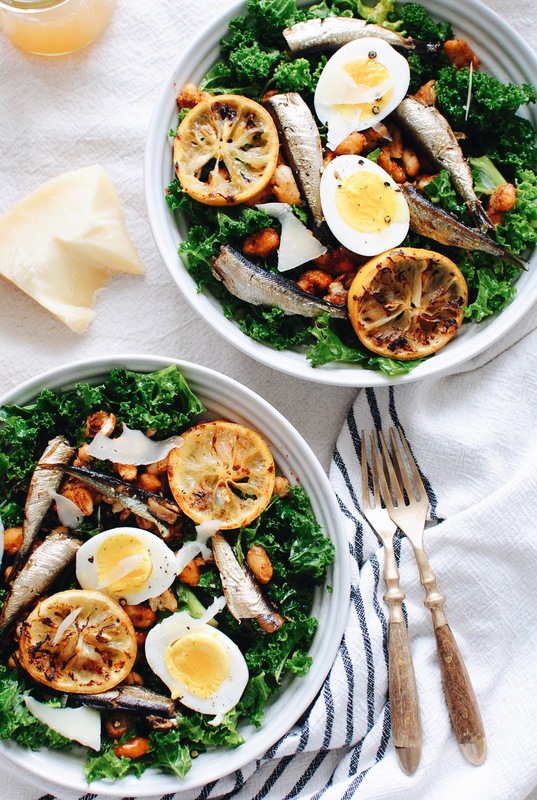 What is your favorite brand of sardines? I love them and so does my four-year-old! SOOO the brand I used for this is Polar, but I love a ton! World Market has some great ones, Trader Joe's - you can find good ones anywhere! My bf is a huge sardine lover - always trying to get me to try one his scary fishy mustardy cracker thingies. Nope! 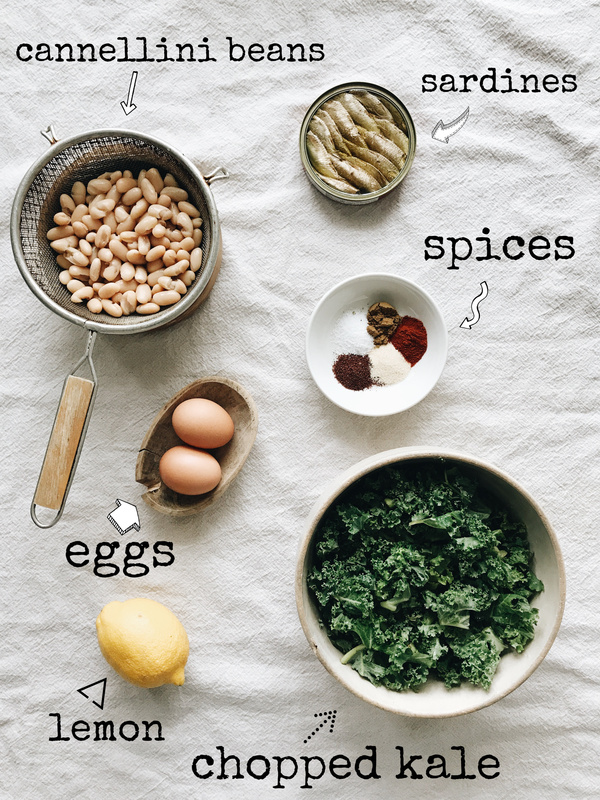 But, I just so happen to have every one of these ingredients in my kitchen right now. So looks like tonight's the night I dive into the sardine pond! I LURRVE sardines. I saute them in the oil from the tin with some Italian seasonings until they turn into a paste and then I add chopped tomatoes and make a sauce for pasta. It comes out very nutty and meaty tasting...not fishy at all, although it does smell fishy when it first hits the pan. OMG, I must do this! It sounds freaking incredible. Do you add toasted breadcrumbs or anything to finish? LOVE THIS. So I have a long sardine story that I normally wouldn’t tell but for some reason I feel you’d enjoy it. You know how kids are picky eaters and tend to only eat the same thing over and over again? That was me. WITH SARDINES. I wasn’t picky, but they were my favorite food so I’d eat them for every meal, every day with whatever else we were having. This part gets a little fishy (pun!) but for some reason I had to go to the dr and had some tests done (I firmly believed I blocked this out because of trauma) and basically the dr said I was eating entirely too many sardine and could only have them once a week. I was devastated. So, “sardine saturdays” became a thing until I was old enough to have friends and realized it was NOT COOL to eat fish from a tin so I went on hiatus. I’ll still have them occasionally but when you insta storied this I got so jazzed! So much so, I bought sardines today before you posted it and totally got the wrong ones (water, not oil). Guess I’ll have to go get more! If this starts a downward spiral that ends with me in the hospital I’ll totally blame you. 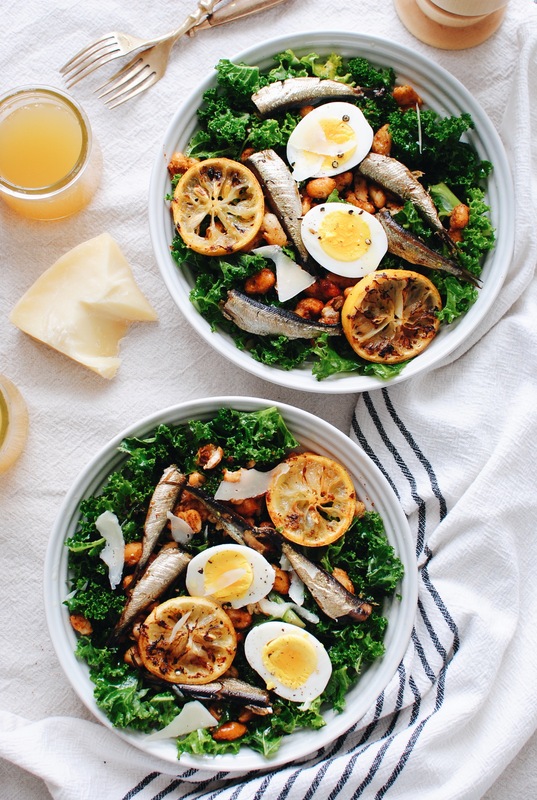 What's wrong with eating too many sardines? Honestly curious. I love sardines! My favorite way to eat them is on avocado toast with hot sauce or the TJ’s Dijon Sauce (do they even still make that? I’m so far from a TJ’s). Also, I make sardine pate by mash in the, with butter and some grainy Dijon and serving with the crackers and Cornichon. Such an easy snack when I need something classyish to go with my rosé. I know the skin and bones freak some people out, but swearsies it’s not like when you accidentally buy bone in canned salmon and your life is basically over. The bones are basically dissolved and teeny tiny to begin with. I love just about any fish, including sardines. However, I'm not familiar with sumac at all and keep seeing it on a lot of the blogs I stalk. No clue what this stuff tastes like and none of my local markets carry it so if I get it, it will probably be from Amazon. Is there anything you can think of that it tastes like? Curious but not so curious that I'm ordering it. I grew up eating them mashed up, spread on a saltine and topped with sliced scallions. It's the only way I eat them now. BUT I think you've change that! Also, what does sumac taste like? I don't have any but have seen quite a few recipes lately using it. Do you eat the lemons?? Planning on making this... look SO delish!